Does it get any better than this for kids? A double-decker pontoon boat with double-water slides?!?! I know, I know, this is a “chic family” travel blog and a pontoon boat is not the most sophisticated vessel of the sea. The truth be known, we are from the south ! 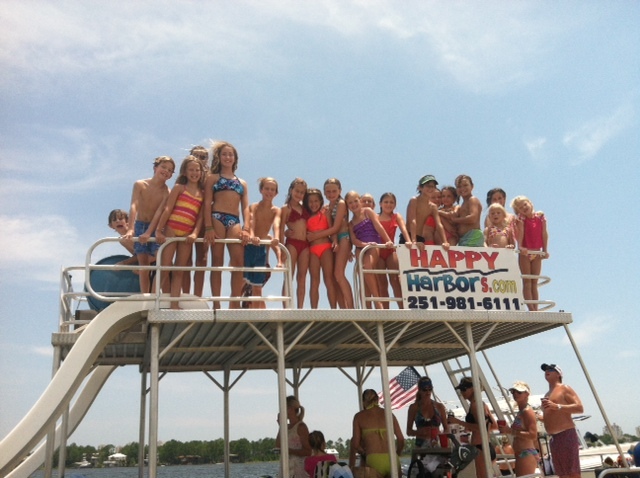 If the kids are happy then so is momma, even on a pontoon. Children cannot get enough of the water slides on a pontoon parked at an island off Ono Island in Orange Beach Alabama. Even chic travelers like to have fun! We have luxury Orange Beach vacation rentals with boat slips on Ole River and across the street from the beach. This is the ONLY way the locals do it. Book an Orange Beach Alabama vacation rental with Prickett Properties and we will show you how it is done!